On the 10th Anniversary of the Lehman Brothers 2008 Crash: Can ‘IT’ Happen Again? This past weekend, September 15-16, marked the 10th anniversary of the Lehman Brothers Investment bank collapse and the subsequent generalized financial system crash that followed. Business and mainstream media flooded the airwaves and print publications with recounts and assessments of the events of ten years past. Most promoted the theme about how the Federal Reserve central bank and the US Treasury rescued us all from another 1930s-like depression. The corollary message is that ‘IT’ can’t happen today because of the various reforms instituted in the wake of the crash that now prevent the repeat of something similar like 2008. Buried in the reviews of 2008 events is the sticky question of whether the investment bank, Lehman Brothers, should have been allowed to fail—as the US Treasury Secretary, Hank Paulson, and the chair of the Federal Reserve, Ben Bernanke, decided to allow. The collapse of Lehman precipitated a chain of events and subsequent failures that resulted in a virtual freeze up of the entire US (and much of the rest of the global) financial system. Credit not only contracted—it essentially disappeared altogether for a period of time. The almost total absence of available credit spilled over to the rest of the non-financial economy. Businesses laid off workers at the rate of 1 million a month for the next six months—a trajectory almost exactly that of 1929-1930. By March 2009, even mainstream economists like Paul Krugman were declaring we had entered another ‘great depression’. Ever since 2008 a debate has simmered whether Paulson-Bernanke should have allowed Lehman Brothers to go under, thus precipitating a chain reaction of derivatives claims that reverberated throughout the US banking system and beyond. The giant insurance company, AIG, a major issuer of derivatives contracts, quickly required bailout after Lehman’s collapse. Brokerages like Merrill Lynch were bailed as well. The big banks—Bank of America and Citigroup—were technically bankrupt by late 2008 and could have been dismantled were it not for $300 billion in debt payment guarantees by the US government. The financial arms of the auto companies, especially General Motors’ GMAC, which had invested heavily in subprime mortgages, dragged down their operating companies until bailed out by another $180 billion government infusion. Mid-tier banks were provided more than $100 billion. And the Federal Reserve set up special ‘facilities’—aka auctions—for various sectors of the financial system and provided emergency funds based on whatever interest they, the mutual funds, investment banks, and others said they wanted to pay. The borrowers, in other words, set their own interest rates. Those rates were quickly driven down by the Fed, to an historic low of 0.10% and kept there for another 7 years. The Fed then paid 0.25% to whoever borrowed from it and left the borrowed funds with it—i.e. a free subsidy of 0.15% for doing nothing. The Democratic Congress did its part as well, allowing banks to suspend normal ‘mark to market’ accounting practices and thus lie about how bad their balance sheets actually were. The Fed then conducted phony ‘stress tests’ of the banks to help them cover up their insolvent condition so that investors might then again start buying bank stocks that had collapsed. Thereafter, over the next seven years, through 2016, by means of its quantitative easing QE program, the Fed bought up bad assets from the banks, shadow banks, and individual investors totaling more than $6 trillion (often at above market prices for those securities). On the fiscal policy side of bailout, the Obama administration provided a mere $25 billion to help bail out the 14 million homeowners that would eventually face foreclosures during the crash and ‘recovery’ period. In contrast, however, it provided $1 trillion in business-investor tax cuts in 2009 and 2010 ($200 billion in the 2009 Recovery Program, supplemented by another $800 billion at the close of 2010). Obama would then extend the Bush tax cuts of 2001-04 for another two years, 2010-2012, at a cost of $450 billion a year. And to top it off, in January 2013 Obama agreed to extend the Bush tax cuts for another decade at a cost to the Treasury of yet another $5 Trillion in what was called the ‘fiscal cliff’ deal with the now Republican Congress. This unprecedented, massive bailout of bankers, corporations, and owners of capital incomes was arguably set in motion or accelerated by Paulson and Bernanke, by allowing the collapse of Lehman Brothers—one of the two milestone events of the 2008 crisis. The other milesdtone, occurring in March 2008, was the bailout by Bernanke’s Fed of the Bear Stearns investment bank. The Sticky Debate: Why Bear But Not Lehman? The debate about why Bear Stearns was bailed, and Lehman not, has never quite gone away since the events of 2008. Nor has the contending arguments whether Lehman should have been allowed to fail. Autobiographies published by Paulson, Bernanke, and Tim Geithner (head of the key New York Fed district charged with big bank regulation)—i.e. all the key decision makers re. 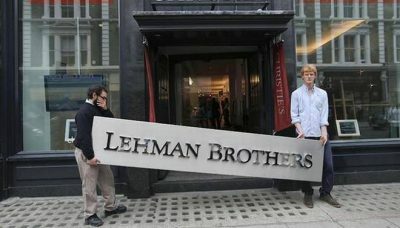 Lehman at the time—all insist that Lehman should not have been bailed, or that they just did not see the consequences. In other words, it was either the ‘right decision’ or a simple mistake. But there is another argument that has been more or less suppressed in the press and media: that Lehman was allowed to fail in order for Goldman Sachs investment bank to benefit by reaping tens of billions of dollars on derivative contracts from the insurance giant, AIG. When AIG then went under, Paulson moved quickly to bail AIG out (unlike Lehman a week earlier), at a cost to the Treasury of $180 billion at the time. Similarly, in the case of Bear Stearns the preceding March 2008, it too was bailed out, by the Fed which provided a $29 billion loan to JP Morgan Chase to absorb Bear Stearns’ assets at pennies on the dollar. Goldman thus benefited greatly from Lehman’s collapse while Chase similarly did from Bear Stearns’ rescue. And the government—the US Treasury and Federal Reserve—was complicit in arranging the bailout of the one and the collapse of the other. The apparent anomaly of why Bear was bailed and Lehman allowed to go under is thus explainable by the US government’s role allowing even bigger and more influential banks—JP Morgan Chase and Goldman Sachs—to gobble up their competitors (Bear and Lehman) on the cheap. In the one, Chase benefited from the bailout; in the other, Goldman benefited from the collapse. This suggests the unifying element of the apparent different treatments of Bear v. Lehman was the US government—Treasury and Fed—unofficial policy at the time of trying to resolve the crisis by making even bigger banks more financially solvent, and thus able to withstand the crisis, at the expense of the smaller. This policy of saving the big bankers at the expense of the smaller was disastrous, however. In the case of Bear Stearns, it gave a signal to speculators they could attack and drive down the stock prices of other financial institutions and the Fed-Treasury would do nothing. And that’s exactly what happened after March 2008, as the vultures descending on Fannie Mae and Freddie Mac, the GSEs, that Paulson’s Treasury then bailed out at a cost of $300 billion; then attacked smaller banks like Washington Mutual, causing it too to fail; then moved on to brokerages like Merrill Lynch; and then Lehman. If the speculators and short-sellers of these bank and financial institutions’ stocks were prevented from doing what they did by Paulson and the Treasury, or Congressional action, there would have been no Lehman to allow to collapse—or Washington Mutual, or AIG, or GMAC or Bank of America or Citigroup, or the $6 trillion Fed bailout that followed, 2009-16. Few progressive economists bother to investigate all this, allowing their commentary to fall into the ‘safe zone’ trap of discussion themes set by the business and official mainstream press. Like the mainstream press, they have tended to focus on whether the Lehman collapse was ‘necessary’—and not on ‘who benefited’, why, and the role of the US government (Treasury and Fed). One exception to this is the recently released book by Laurence Ball, definitely not a progressive or ‘left’ economist. His ‘The Fed and the Lehman Brothers’ book (Cambridge University Press, 2018) dives into this question of the contributing role of the Treasury and the Federal Reserve in engineering the failure of Lehman Brothers (if not the similar event of Bear Stearns). It’s an essential read. Yours truly also raised the issue back in 2010 in my own book, ‘Epic Recession: Prelude to Global Depression’, (Pluto books, London, 2010). In the book I argue that Bear Stearns—the first ‘bookend’ to the crisis—set in motion a chain reaction of liquidity and insolvency events throughout the ‘shadow banking’ sector starting in early 2008 that culminated in the Lehman crash in September. Lehman’s implosion then exacerbated and deepened the liquidity-insolvency problems throughout virtually the entire financial system, as contagion spread as the ‘transmission mechanisms’ of the crisis—i.e. accelerating general asset price deflation and derivatives liability claims between banks and financial institutions—infected one credit sector after another, including international. With Lehman, what had started as a subprime mortgage problem in 2007, had now become a generalized credit problem connected by the cancerous thread of derivatives linking banks and financial institutions globally. 2008 was a derivatives crisis not a mortgage crisis. Bear Stearns’ collapse was caused in large part by the giant commercial bank, J.P. Morgan Chase—which eventually became the big beneficiary of Bear Stearns’ insolvency. JP Morgan Chase’s eventual takeover of Bear Stearns in April 2008 was arranged with the direct assistance of Ben Bernanke’s Federal Reserve, the US central bank. Bernanke arranged a low interest loan of $29 billion to Chase with which it ‘bought’ up Bear Stearns’ assets. Chase thus did not commit any of its own capital. Chase acquired Bear assets for pennies on the dollar. Bear Stearns’ New York Manhattan building and properties alone were worth more than $100 billion. Its remaining financial assets and accounts billions of dollars more. Its customer base was worth untold further billions to Chase. Similarly, the Lehman collapse was engineered with the help of the US government—specifically the direct assistance of the US Treasury. In the Lehman case the direct beneficiary of the Lehman collapse was the Goldman Sachs investment bank, a main competitor of Lehman. The Fed did not offer to bail out Lehman, unlike Bear Stearns. Bernanke’s weak excuse was it did not have the authority to do so. Or the liquidity, since it, the Fed, had expended most of its balance sheet assets in preceding months in bailing out Bear and others. The latter argument is specious. The Treasury could have easily provided the Fed the liquidity to bail out Lehman. But as Laurence Ball, in his ‘The Fed and Lehman Brothers’ summarizes in his four year study of the Lehman case: “the Fed could have rescued Lehman but officials chose not to because of political pressures”. What officials? What political pressures? The officials and pressures suggests Treasury Secretary, Henry Paulson, who just two years prior was the CEO of Goldman Sachs. By allowing Lehman to go under, Paulson ensured that his former employer, Goldman Sachs (whose stock he personally still held when leaving Goldman in 2006), would be able to collect on the billions of dollars in Credit Default Swaps (CDS) it bought from AIG. CDS’s are ‘bets’ that an institution will fail. If it fails, the issuer of the CDS bets has to pay off the buyer of the CDS. AIG had issued a massive number of CDS that Lehman would fail. It would have to pay Goldman if Lehman failed tens of billions of dollars. When Lehman was allowed to fail (by Paulson), Goldman collected. Because AIG had over-issued CDS on Lehman that it did not have the resources to pay—AIG became insolvent as well. By bailing out AIG to the tune of $180, AIG was able to pay Goldman and others on their CDS bets that Lehman would fail. In short, Lehman was allowed to fail (by Paulson’s decision), so AIG could provide a tens of billions of dollars windfall to Goldman Sachs, Paulson’s former employer, and Paulson approves the AIG bailout so it could pay Goldman. If this isn’t a ‘smoking gun’ then what is? Of course, no one was about to investigate Paulson’s role (and Bernanke’s willingness to go along and not bail out Lehman as well) in all this despite the prima facie evidence. After all, none of the actual bankers responsible for the 2008 crisis in general were ever indicted or went to jail. So why would the US government’s Treasury Secretary, big banker, CEO of Goldman be charged with anything? It is important to understand that the US government played a central role in assisting the two larger banks—Chase and Goldman—to gobble up their smaller capitalist competitors, Bear Stearns and Lehman Brothers. And that this assistance occurred after both Chase and Goldman played a key role causing the collapse of Bear and Lehman. Bear’s rescue directly benefited JP Morgan Chase in the tens of billions; Lehman’s collapse benefited Goldman Sachs in the tens of billions as well. Capitalist bankers devour each other, but US politicians play their part as well. That’s how the system works. This role of government and politicians in the 2008 banking crash is often treated shallowly, or altogether ignored, by mainstream economic and business reviewers of the 2008 crash—Ball’s book somewhat to the contrary. This week marks the 10th anniversary of the 2008 crash. Most say that ‘It’ could never happen again. Banks are better regulated. They have significant capital buffers to offset losses should another collapse of their asset prices occur. We have the ‘Volcker Rule’. The subprime mortgage housing problem is no longer. Housing finance reforms are in place. And so forth. But don’t bet on it. And don’t bet that in the next crisis coming that government and politicians won’t be deeply involved in assisting their bigger banker friends making money off the crisis. For capitalist banks are cannibals. They eat their own. Never was this more obvious than during the 2008 financial crisis. And our government and politicians are there to ensure that they are well fed. (Readers interested in my analysis of the Bear-Lehman ‘bookend events’ to the 2008 crisis are welcomed to read the excerpts on the events of March to September 2008 on my website which is accessible here). Jack Rasmus is the author of the forthcoming book, ‘The Scourge of Neoliberalism: Economic Policy in the US from Reagan to Trump’, to be published by Clarity Press. His latest book is ‘Central Bankers at the End of Their Ropes: Monetary Policy and the Coming Depression’, 2017, also published by Clarity. He blogs at jackrasmus.com and his twitter handle is @drjackrasmus. he is a frequent contributor to Global Research.